The Leica DNA03 and DNA10 are the highest precision digital levels developed for civil engineering work and high accuracy leveling work. You may discover a whole new world of advantages which facilitate your daily work and save your time. 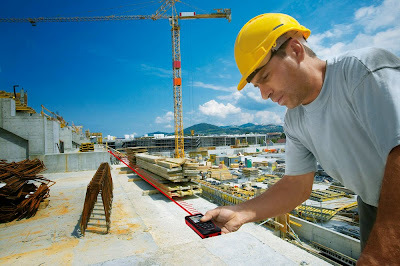 The Leica DNA digital level measures, saves the height and the distance to the staff at the press of a single button. The advantage from a digital level are no optical readings are required, no copying or writing down and no calculation by hand. The new "Meas & Rec" function lets you easily measure and record height differences, while the line levelling applications program guides you securely through the different possibilities of measuring whole level lines. Introducing the Leica DISTO D510 Professional Package for precise exterior and interior measuring. It consists of the Leica DISTO D510, the Leica FTA360 adapter and the Leica TRI70 tripod. No need to think about additional accessories - customers benefit from the complete measuring system in a protective carrying case. Precise measuring over long distances requires a stable set-up of the laser distance meter. It is often difficult to fine adjust the laser dot at the target point by holding the device to a solid reference. We have addressed this challenge with this professional package. 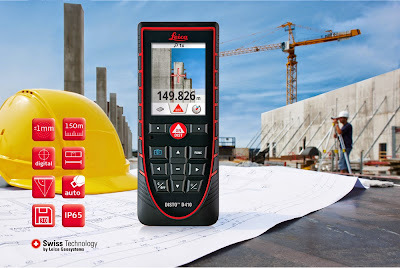 The Leica DISTO D510 laser distance meter with its digital Pointfinder is the right choice for outdoor use on construction sites. Designed for job site use, the Leica DISTO D510 meets tough dust and waterproof requirements. Construction professionals benefit from improved workflows for project documentation and wireless data exchange with its latest Bluetooth Smart technology. Customers can trust that the Leica DISTO D510 performs the specified measuring accuracy and range under job site conditions. Confirmed by ISO 16331-1 certification - we keep our promise. The Leica FTA360 adapter features an easy fine adjustment system for convenient and accurate aiming and fits perfectly to the Leica TRI70 tripod . 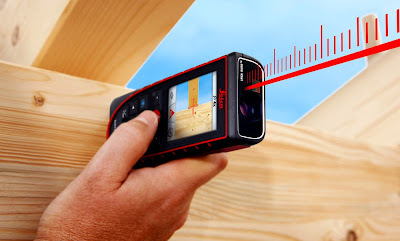 Together with the FTA360 adapter the Leica DISTO D510 touch becomes a highly precise measuring system. Leica Geosystems has launched the Leica DISTO D410 laser measuring device for precise targeting and simple outdoor measurement. 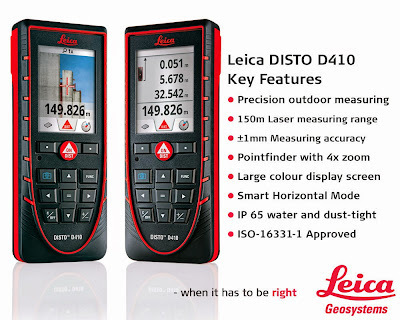 Leica DISTO D410 – your perfect partner for simple and precise outdoor measurement! 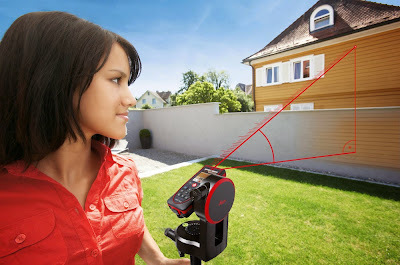 The Leica DISTO D410 features a high precision laser measuring module which can measure outdoors to a distance of 150m. Targeting the laser dot over this distance is performed by the high resolution Pointfinder. Even if the red laser point is no longer visible, the target can be seen exactly on the display. With the Pointfinder with 4x zoom, the Leica DISTO D410 takes measurements with perfect accuracy and in unfavourable light conditions. This is a decisive advantage when working outside in sunny weather. Even if the red laser point is no longer visible, the target can be seen exactly on the display. Even if obstructions such as walls, hedges or people stand in the direction of the target, the Leica DISTO D410 quickly comes up with an accurate result thanks to the "Smart Horizontal Mode". One measurement is enough for the required horizontal distance to appear on the display. The range and accuracy of the Leica DISTO D410 are tested to ISO-16331-1. That means it has a long range of 150 m and achieves an extremely high accuracy of ± 1 mm, not only under perfect laboratory conditions, but also in everyday use on site. The Leica DISTO D410 housing and keypad are specially sealed against water and dust. Cleaning under running water is also no problem. Furthermore the laser distance meter can be used in all weather conditions, being dust-proof and water jet protected (IP65). Locating buried cables by a Cable Avoidance Tool (CAT or cable locator) works by detecting electromagnetic signals passing through the utility (cable or pipe). Where there is a weak or no signal present, the utility cannot be detected with just a cable. An artificial signal is applied to the utility to provide a detectable signal and improve the detection reliability. A signal generator (Genny) applies a signal to the utility, which the cable locator can detect. The cable locator is set to the same signal mode as the genny. Commonly this is a 33 kHz signal, although other frequencies are also used with different characteristics and advantage depending on the site situation and application. Some applications may encounter a small diameter cable running in the ground, which on occasions may cause the signal from the signal generator to reduce in strength and become undetectable. Some modern signal generators provide the option of increasing the signal frequency or increasing the signal power. Cable Detection provides the ‘BOOST’ mode in their signal generators, increasing the energy transferred through the tracing utility above the normal level output. Where a 2x signal output results in 2x improvement in the CAT detected signal. Cable Detection’s signal transmitters are available with increased output power setting controls, the T100 to a maximum of 1 Watt and T300 to a maximum of 3 Watt. The variable output power settings enable the operator to select the right level of signal boost for the site conditions, normally the power on "default level "is OK for most applications with good battery life and trace performance, rated at 100 mW, this is the common industry standard. Where site conditions require increased performance the transmitter output setting can be increased to HIGH or BOOST levels, the site conditions for this might include greater tracing range, inducing a signal onto a deeper utility (where the efficiency is reduced) or where the cable impedance is high and low level of signal is present (small diameter cable). The performance of the combination between the cable locator and signal transmitter can be improved by increasing the signal frequency (131 kHz gives 4x improved signal over 33 kHz) or by boosting the power of the same signal x4 with T100 or x12 with T300. It should also be understood that when increasing the signal frequency that the tracing signal will be increased but perhaps importantly the tracing range is reduced. In comparison boosting the transmitter power delivers the same locating performance benefit and perhaps importantly for some users with the added benefit of the same tracing characteristics and increased range that may also be important. Inspection of safety equipment is imperative to ensuring that the life saving equipment is in the best working order before and after every use. Failure to undertake this simple task could lead to a person working onsite being injured or even killed. Inspection of equipment manufactured from webbing only takes a few minutes. Survey Express Services have produced a simple guide which can be downloaded. Radiodetection has announced that they have extended their market leading CAT4 cable avoidance range to include fully integrated, automatic GPS and enhanced logging and data analysis capabilities. The enhanced logging capabilities of the RD gCAT4 allows accurate records to be kept and analysed, showing not only how an operator was working, but also where a C.A.T was being used. The comprehensive data logging capabilities of the RD gC.A.T4 allow fleet managers to review one year or more of usage data which can then be used to assess individual locate operations in order to ensure compliance with best-practice, or to identify training needs. By using the C.A.T Manager PC Software users can export CSV, XLS or KML files that can be quickly imported into map services like Google Earth. 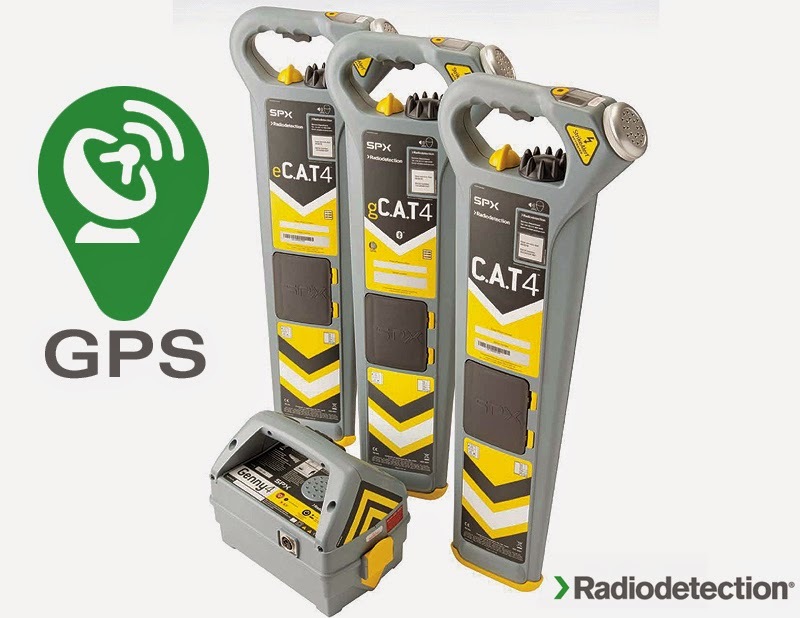 The Radiodetection C.A.T4 range, launched in 2012, has revolutionised the way the locating industry operates thanks to innovative features such as dual frequency small diameter cable locating and built in data logging, that have helped to improve the quality of locate operations and reduce cable strikes. 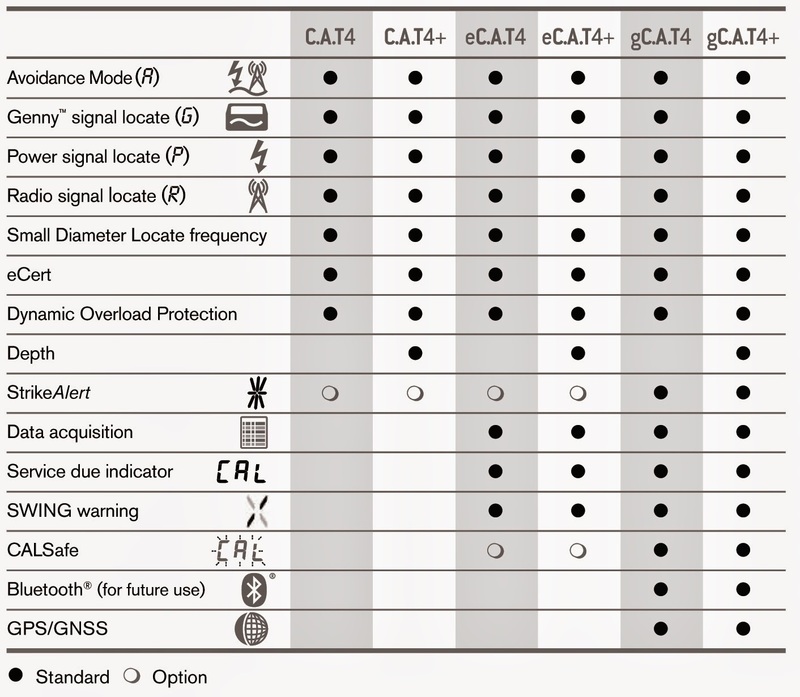 As detailed below, the Radiodetection gCAT4 incorporates the full range of features including datalogging, StrikeAlert, Swing alert, CALSafe and Bluetooth. 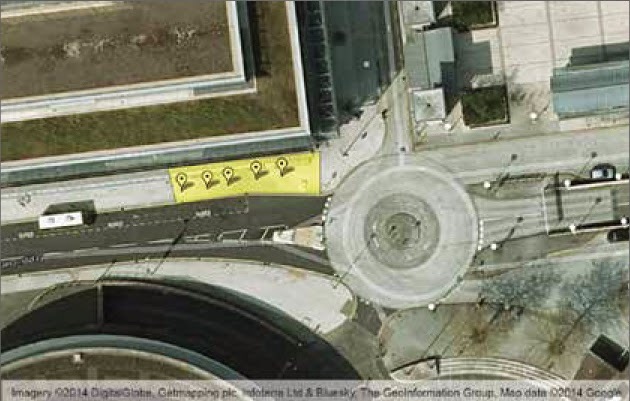 The Radiodetection gCAT4+ features depth location. 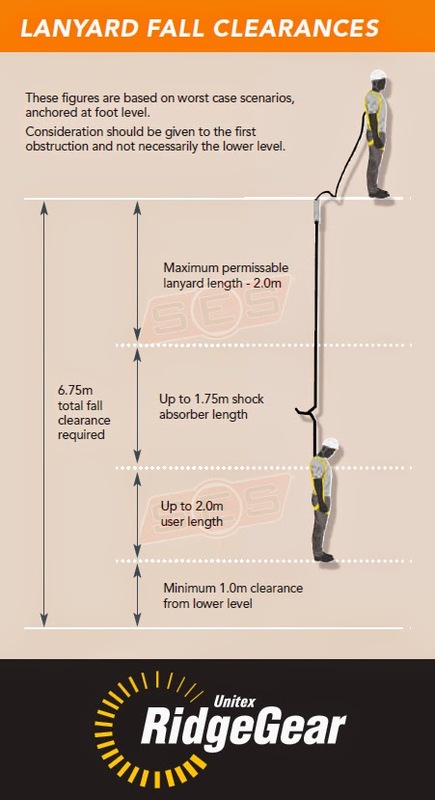 Why is it important to know the stopping length of a fall arrest lanyard? A fall arrest lanyard features a shock absorber which helps slows down the fall of a person. This additional length is in addition to the initial length of the lanyard. So hypnotically, a person could still receive major injury even though the fall arrest lanyard has deployed its shock absorber pack. The overall combined length of the deployed lanyard and the height of the individual could be longer than the height of the fall. If so, injuring to the person will happen. A 2.0m shock-absorbing lanyard allows for up to 2.0m of free-fall distance before activating, and another 1.75m of deceleration distance before arresting a fall. In addition you will have the height of the individual on top of the lanyard lengths. If you have 5.75m of fall clearance or less, you're going to hit the ground. It is advised to add an extra 1.0m to the overall deployed length to adjust for harness stretch and ‘D’ ring slip. Another element for safety of lanyards, is the position of the anchor point. The anchorage point should be at a height that minimizes the risk of contact with the ground or a lower level. Why it is important to anchor as high overhead as possible? If there is not enough room below to accommodate a potential fall clearance, use other equipment such as a restraint lanyard. A restraint lanyard is to restraint the worker from approaching the fall edge and not to decelerate the fall. A restraint lanyard length should be specified to stop the person from gaining access to the edge of the floor or roof. This short length is to ‘restraint’ or prevent the fall, not assist in slowing of the fall. Copyright 2014 Survey Express Services. Picture Window theme. Powered by Blogger.